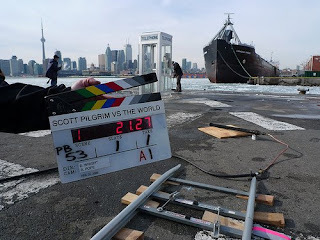 I'm in one of those "missing Toronto" phases at the moment so I am particularly loving Edgar Wright's photo blog, Edgar Wright Here, from Toronto. I like Simon Pegg :) Did u see him in Hott Fuzz? I love that movie! I thought Penelope Wilton, who played Shaun's mum, was perfect for the part. She's an actress who has graced our screens for decades. Edgar picked the right person the part, there! Yeah, Hot Fuzz was ok....i preferred Shaun of the Dead though. Scott Pilgrim vs the World looks like it is going to be amazing!